Are you a Porsche enthusiast? If so, you’re in good company with us. 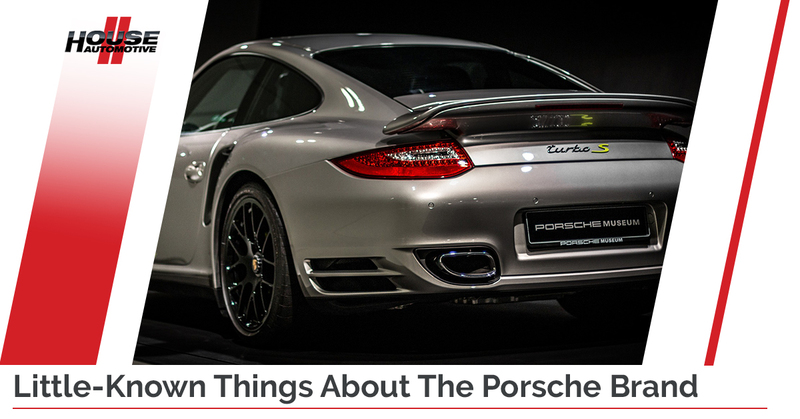 Chances are, you probably know quite a lot about your very own Porsche, or even the Porsche brand itself. But did you know that the legendary 911 was nearly called the 901? Or did you know that Porsche once designed a tractor specifically built for coffee farming? This legendary auto manufacturer has a rather long-standing history, and in today’s blog post, your go-to Pasadena Porsche repair experts are here to take a look at some of the lesser-known things about our favorite car brand. If you live in the greater Los Angeles area and you’re in need of reputable Porsche repair services, rest assured that HOUSE Automotive can and will take great care of you and your Porsche. From quality Porsche transmission repair to being honest and fair about all of our Porsche repair costs, there’s no surprise that we’re Pasadena’s preferred Porsche auto repair shop. Learn more about our independent Porsche repair services today! It’s true; the Dutch Police used to drive the Porsche 356 as their official vehicle, but only 10 were made. Porsche actually built an extra ten models a full year after production stopped, just for the Dutch Police! Rumor has it that, out of all people, Jerry Seinfeld owns a 356. If you thought that Porsche making tractors was a bit of an offbeat from their typical high-performance driving machines, then the idea of a Porsche-designed forklift is probably pretty amusing. Since the early 1980s, Porsche has continuously won awards for their designs of Linde Material Handling’s forklifts. Seriously, no joke. Again, we’re not pulling your leg on this one. If you’ve ever flown in an Airbus A300, then you’ve flown in a Porsche-designed plane – well, at least the cockpit is Porsche-designed. Among the many advances were digital screens for the pilots instead of analog readouts. We’re sure that the digital screens were just as re-assuring for passengers as they were for pilots. Things were a little different back in the 70s and 80s. Indeed, this was a time when most companies charged you extra just to have an airbag in the steering wheel, let alone in other parts of the car. Being the automotive pioneers that Porsche are, the 1986 Porsche 944 was the first car sold in the United States that included a passenger airbag as standard safety equipment. Of course, all major automobile manufacturers soon followed suit. Hey, at least early cars came with seat belts…after a certain point in time. Nobody tends to think of the Harley-Davidson motorcycle brand as distinctly German, and that’s because they’re not. However, certain Harley models utilize Porsche engines. Take, for example, the Harley V-Rod – this bad boy features an advanced, 60 degree, double overhead cam engine that was specifically developed for Harley’s racing division. Nothing says “we trust your automotive engineering excellence” more than hiring Porsche to build high-end motorcycle engines for Harley-Davidson. We understand that there’s a great deal of choice in the Los Angeles area when it comes to repairing and servicing your valuable Porsche. As Porsche enthusiasts ourselves, HOUSE Automotive takes great pride in our work, ensuring that your Porsche 911, Boxster, Cayenne or other model of Porsche runs perfectly without fail. If you have any questions about our Porsche repair costs or you’d like to set up an appointment with our Porsche repair experts, get in touch with HOUSE Automotive today!